Soon, Mia and I will be posting to a food blog. Until then, however, I will post food-related things here. Tonight I, alone, and by myself, with no help whatsoever, made pumpkin biscotti, using a slightly modified recipe from Simply Recipes. 1. Preheat oven to 350°F. Sift together the flour, salt, sugar, baking powder, and spices into a large bowl. 2. In another bowl, whisk together the eggs, pumpkin purée, and vanilla extract. Pour the pumpkin mixture into the flour mixture. Give it a rough stir to generally incorporate the ingredients, the dough will be crumbly. 3. Flour your hands and a clean kitchen surface and lightly knead the dough. Add the raisins, walnuts, and chips. Lightly grease a baking sheet or line it with parchment paper. Form the dough into a large log, roughly about 15-20 inches by 6-7 inches. The loaves should be relatively flat, only about 1/2 inch high. Bake for 22-30 minutes at 350 F, until the center is firm to the touch. 4. 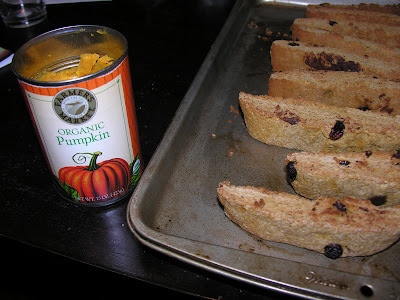 Let biscotti cool for 15 minutes and then using a serrated knife cut into 1 inch wide pieces. Turn the oven to 300 F and bake for an additional 15-20 minutes. Cool completely. 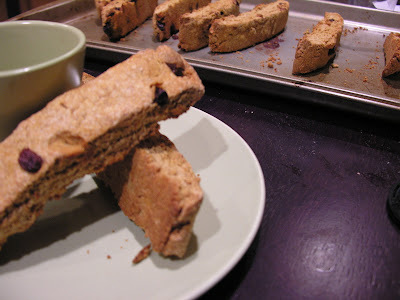 Biscotti may be still a tad moist and chewy, so if you prefer it crisp let it sit uncovered overnight in a dry space. Serve and enjoy.